Sometimes you learn more when things go wrong than you do when they go well. We were in Mykonos half way through our 2018 Northern Summer sailing adventure on our yacht ‘Swallow’. The Meltemi is a Katabatic wind that blows North to South through the Aegean in the summer months. It is at its strongest in July and August and in the central Cyclades Islands, when and where we were. We are used to strong winds but nothing like this, which blew above gale force for weeks on end. We were anchored in a well sheltered bay to the South of Mykonos along with about 100 other boats all seeking shelter. We arrived late and could only find a spot in 25 metres, deeper than we would normally anchor. And so we sat it out watching the wind gauge rise to gusts of storm force at 57 knots. And then the anchor dragged in the deep water until we were uncomfortably close to an expensive super yacht behind, before the anchor bit again, this time in even deeper water. When we tried to pull in the anchor to reset in a safer place, the winch failed with the weight of wind and chain. 1. Cut and run. Leave the anchor and chain tied to some fenders so it floats, and come back for it later. Dangerous to be without the main anchor, but we have two smaller spares, so a possibility. Force majeure, we could have run in to the hotel’s swimming beach in a few feet of water and set one or both smaller anchors in shelter there. 3. Rebuild the winch. As it happens we had a spare winch motor and a manual, but I’ve never rebuilt an anchor winch before. We could cut and run as a last resort. So we prepared the back up anchors, and set the anchor alarm which squeals if we drift more than a prescribed distance. And set to at 6pm to rebuild the winch. The queen sized bunk in the stern cabin was covered up to be the work bench, with the spare motor and tools all lined up. Fortunately the Meltemi drops down a bit at night. By 2am working with focus and teamwork Helga and I had removed the winch, stripped it, drilled out the motor holding set screws that had seized, rebuilt with the new motor and reinstalled. As the wind got up to 56 knots again just before midday, the anchor let go again. The anchor alarm squealed and we just managed to power across the bows of the super yacht astern into clear and deep water. The rebuilt winch responded and we were able to find a recently vacated clear spot in shallower and more sheltered water. 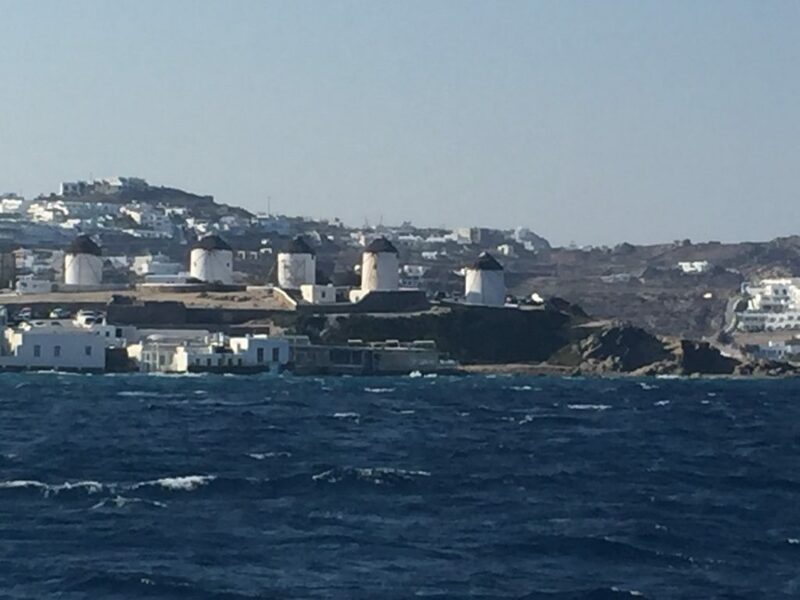 We stayed there in gale and storm force gusts for a further two days before the weather calmed sufficiently to enable us to make the short passage around into the relative shelter of Mykonos Marina. 1. Have a plan, with alternative scenarios. 3. Teamwork and focus wins the day. 4. Maintain the right tools for the job.